This comes from my friend David Volpe. He had a terrible argument with his expensive smoke alarm and this is what he had to say about it. "I am UP. My super $60 "ten year/sealed" smoke detector went off. I looked around, nothing, so I reset it. I reset it again and put it on the front porch; it went off again. I put it OUTSIDE in the fresh air - it went off. I taped the speaker so I couldn't hear it but I still could. I tried the "OFF" function but that didn't work either. Finally, I took it into the kitchen, grabbed a cleaver, and smashed the sh*t out of it but the battery was SEALED to the unit. Finally, I just cut the wires off to the speaker with a steak knife. Bastards. I want my $60 back." 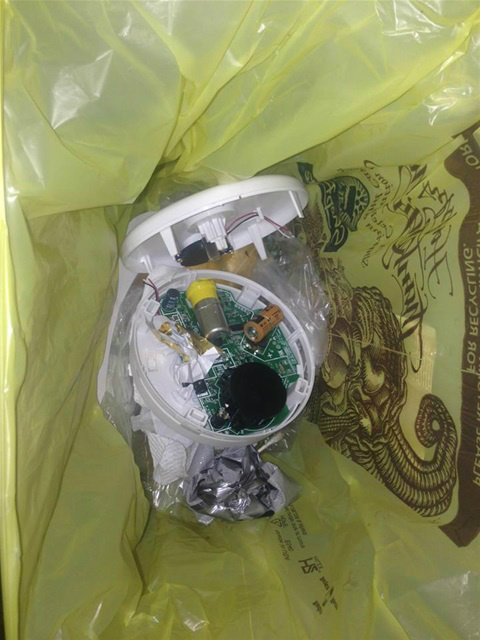 Here's a picture of the final results of the disruptive smoke detector.